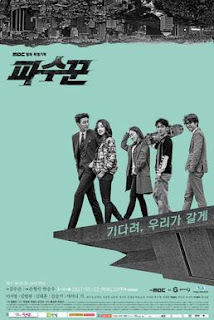 Lookout (Hangul: 파수꾼; RR: Pasooggoon; A.k.a The Guardians) is a South Korean television series starring Lee Si-young, Kim Young-kwang, Kim Tae-hoon, Kim Seul-gi and Key. The drama airs on MBC every Monday and Tuesday at 22:00 (KST) starting May 22, 2017. Plot: Lookout tells the story of a group of people who team up to serve justice themselves after losing their loved ones to criminals. The group consists of a lawyer, prosecutor, hacker, and an extremely shy person. They want to give these criminals the punishment that they deserve, and take matters into their own hands as the corrupt justice system in South Korea fails to capture the culprits..